We’d love your help. Let us know what’s wrong with this preview of The Most Boring Book Ever Written by Rudolf Kerkhoven. To ask other readers questions about The Most Boring Book Ever Written, please sign up. One star for being honest in the title. One thing that stuck out for me was how long the guy spent in the store. I was almost expecting him to take the cashier home. Some of the pages didn't continue correctly. Like a paragraph or three were cut out. Interesting this book was under the "Humor" category. The fair thing to do is go back and read every scenerio, but the first one I chose took such a dull yet interesting turn. It was interesting to see how much the store delayed, but at the same time One star for being honest in the title. I had quite a different view of this book from most others. Frankly, I think it's quite brilliant. On the surface, it's a choose-your-own-adventure parodying the vacuity of modern suburban life. Many of the plotlines take hilarious deep dives into minutiae, transforming tiny events of routine into a commentary on the nature of workaday existence. To me, the exchange at the cash register, in particular, was incredibly funny. But the book also has a darker edge just below the radar of the quick rea I had quite a different view of this book from most others. Frankly, I think it's quite brilliant. On the surface, it's a choose-your-own-adventure parodying the vacuity of modern suburban life. Many of the plotlines take hilarious deep dives into minutiae, transforming tiny events of routine into a commentary on the nature of workaday existence. To me, the exchange at the cash register, in particular, was incredibly funny. But the book also has a darker edge just below the radar of the quick reader. What's happening in the main character's marriage? What did he do when he was a soldier? What will happen to him after he arrives at the airport? The threads of each of the stories intertwine carefully; you can only understand the violence and betrayal simmering underneath the banality of the story once you've followed all the plotlines to their ends. 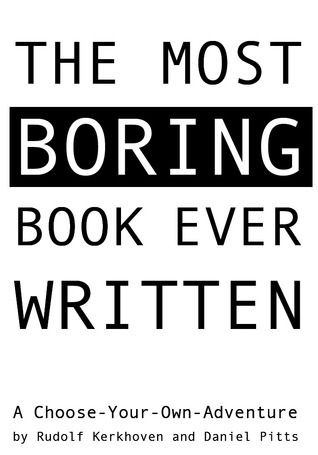 YOOOO the irony is so #deep, because the book is called boring but its actually FUUUN, yo thats RAD bro af yooooooooooooo. thank you for reading my review, i am also writing a book about this EPIC new avocado diet if anyone is interested, please buy. THANKS SISTERS! This book was so entertaining and I was glued to the book. There was at no point where I was bored at ALL. Must read. There isn’t a whole lot to The Most Boring Book Ever Written, so this review will most likely be relatively short. This book is a free ebook available wherever you get your digital literature. It’s a “choose your own adventure” book that uses the mundane nature of everyday life as the driving force of its narrative. For the right demographic, it’s a unique blend of nostalgia and adulthood. I was laughing like an idiot at the simple brilliance of this very unique dichotomy. There are also a number of references to 7-UP mixed into the descriptions of the protagonist’s surroundings. Using the search function on my Kindle app, I learned that there are 25 mentions of 7-UP including such colorful imagery as “The sleek and powerful car sparkles under the early morning sunlight like a freshly poured glass of 7-UP” (Kindle Location 323) and “Roger Wang can proudly lay claim to the best lawn on the block, perpetually as green as a can of 7-UP.” (Kindle Location 466) This absurd “product placement” makes me wonder what motivated the writers to create this book. Is it entertaining? sort of. Its certainly not the most boring book ever written in my opinion, and while its not the best, I would say it lies somewhere in between. I came to the end of the story after 20% the first time around which sort of tells me im boring. and I had a good laugh at that. But it just didn't have some of the more entertaining elements of some other choose your own adventure books ive read. Yes, I'm one of those who stays on the line and don't just hang up. I honestly didn't know what to expect when I initially read the reviews, but I did read it. And, well, this is probably one of the most quirkiest novella's I've ever read! It's interactive, which is a cool approach, and it's a thinking story. Will you shampoo again, go to the conditioner, or dry off and move on? That's just one pondering question you'll come across. I didn't "buy" this book, I am an Amazon Prime member and "borrowed" it. Even though it's an interesting novella, I wou 7-Up anyone? This book is actually quite interesting. It's like 10 different books in one. This is the first ever interactive book I've ever read and I am highly enjoying it. I've read through it 3 times now and got a different story each time. I would have have it 5 stars, but the endless 7-up references are really getting on my nerves. Very amusing free ebook I came across while looking at choose your own adventure book structures. It is a rather boring account of going to work, but the decisions are funny and there's some great dialogue with the family. Okay, I didn't finish it. I barely read what I did "read", but if the author really wanted to write the most boring book, he succeeded. I have enough dull moments in my life to not need to read about someone else's conversation about tuna sandwiches with a supermarket clerk. 3 stars for succeeding at the goal of the book, but only 3 for being, well, boring. It was boring. So it lived up to its name. I liked how you could choose what to do in it. To be fair I didn't read all of the possibilities but I'm sure they were all boring anyway :-) It was a funny concept and I give the author props for that. This one lives up to the title. It is a poorly thought out and extremely dull choose-your-own-adventure. It really has no reason for existence and I discovered the hard way that yet again another five minutes of my life was stolen by a horrid book. Don't even bother with this one if it's free. Let's just say the title of this book fits it. I try two different times to read this book and both times I could not get into it. So sad I was just hoping it's title was a joke and the book was actually humorous instead. The book's title is a bit more as leading, but the content of the sorry is simple. I some how found it funny the way it was written, because it wasn't what I expected the Most Boring Book to be about. Honest to the title. This is truly the most boring book.I thought there would be some crazy twist but no, nothing. Pointless. Don't waste your time. This is a choose your own adventure book. It's just life choices, no adventure. I only tried one story, but it really was boring. Well the title and the blurb warned me. I thought it was using reverse psychology. I was prepared for all sorts of craziness to unfold. Read the title again and understand the author is not joking. Well, I didn't realize it was a choose your own adventure book. I have "read" it three times and it really is the most boring book ever written, but it made me laugh, so that says something. It had great reviews on Amazon but I was not impressed. As a "story" there is nothing to it. As an experiment, or even just a hypothesis, it is a success. As others have mentioned, it is quick and easy, and then you're in on the joke. This book is at once very boring but so well written that it's enjoyable. I need to read through it again to see if I'm missing something, because it seems as though maybe I did??? I'm amazed at how banal and boring the authors made this. It was boring. But amusing in an odd way lol Great book for reading before bed when you dont want to really think about anything too deep. It is a choose-your-own-adventure book, btw.